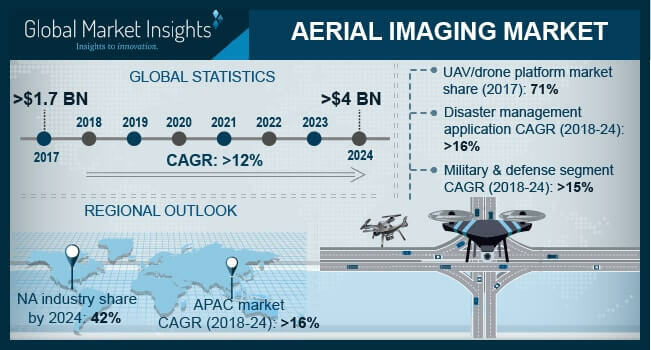 Aerial Imaging Market size is set to exceed USD 4 billion by 2024 according to a new research report by Global Market Insights, Inc. The aerial imaging market growth is attributed to the rising adoption of drones for aerial photography applications. There has been an exponential increase in the use of UAVs for aerial photography applications over the past decade due to the key cost-benefits that they offer over traditional imaging platforms such as helicopter and fixed-wing aircraft-mounted camera platforms. Drones offer excellent maneuverability in congested urban areas where large aircraft cannot venture for capturing aerial images. This capability of drones is majorly leveraged by the real-estate sector for capturing aerial photographs of construction projects in urban areas. There has been a significant increase in the incidents of natural disasters over the past four decades. According to the Centre for Research on the Epidemiology of Disasters (CRED), the Emergency Events Database (EM-DAT) reports that the frequency of natural disasters has increased nearly three-fold from over 1,300 events in 1975–1984 to over 3,900 in 2005–2014. Aerial imaging largely facilitates the timely assessment of affected areas and assists in quickly expediting appropriate repair and relief operations. The vertical imaging segment held the majority share of the aerial imaging market in 2017 due to the major utility of the imaging practice in geospatial mapping applications. As vertical aerial images provide useful data for preparing precise digital models of terrains, they are widely used for mapping functions by government institutions. The urban planning segment is projected to register the fastest growth of over 17% between 2018 and 2024 due to the increasing adoption of aerial photography by government institutions for improving road planning, real estate management, and land use calculations. As aerial images provide city planners with regular up-to-date information on traffic patterns, buildings, railroads, bridges, water features, and other urban infrastructure components, their utility for urban planning is expected to grow significantly over the forecast period. North America is projected to account for the majority market share of around 42% by 2024 due to large-scale investments in aerial imaging technologies by major market players such as Google and government institutions such as the Federal Aviation Administration (FAA) in the U.S. Due to the rapid adoption of UAVs for imaging applications in the agriculture sector in the U.S., the region is expected to witness a steady growth between 2018 and 2024. The companies operating in the aerial imaging market are focusing on offering affordable imaging services to the customers as well as forging strategic partnerships with leading market players to extend their portfolio of aerial photography services and enhance their technological expertise. For instance, in October 2017, Agribotix, one of the leading providers of drone-data processing solutions extended its partnership with The Climate Corporation, a subsidiary of Monsanto Company, to offer aerial imagery technology to the farmers in Brazil through solutions such as the Climate FieldView and Agribotix’s FarmLens platform. In another instance, in May 2018, DJI, a leading global manufacturer of consumer and commercial drones, entered into a strategic partnership with Microsoft to bring advanced machine learning and AI capabilities to DJI drones. DJI also selected Microsoft’s Azure as a preferred cloud computing platform to leverage the platform’s machine learning and AI capabilities to process large volumes of aerial imagery into actionable insights for its customers.